Mission San Rafael. Image courtesy Santa Barbara Mission Archive-Library. Mission San Rafael Arcángel, founded as an asistencia on December 4, 1817 by Jose Vicente de Sarría, is the second to last in the chain of twenty-one California missions. 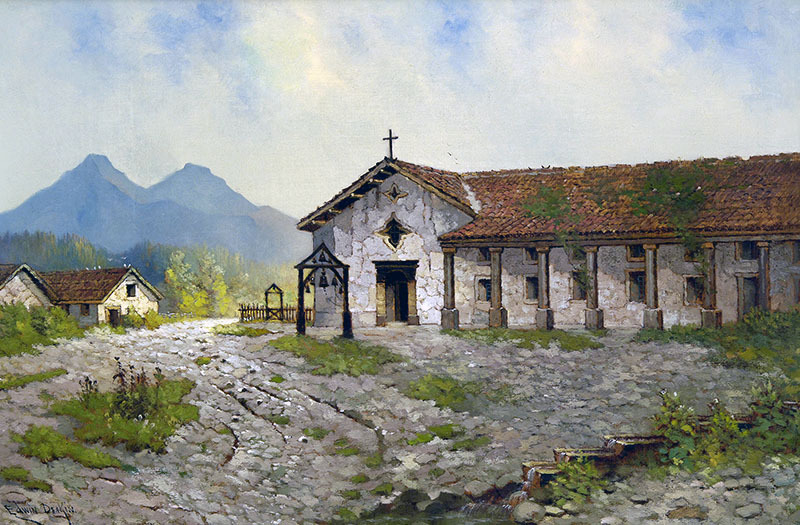 Named after Saint Raphael the Arcángel, the angel of bodily healing, Mission San Rafael began as an asistencia, or helper, to Mission Dolores and the ill northern-California Indians devastated by the inclimate weather in San Francisco. Founders were not sure this asistencia would be successful, but within a year there were nearly three hundred Indians, some from San Francisco and others who came from neighboring areas in Marin County. San Rafael became an active ranch with simple buildings, orchards, livestock, farmlands and an active boat-building operation. After five years, in October 1822, it was decided that San Rafael could be a mission. Mission San Rafael was the first mission to be secularized and by 1861 the buildings had fallen into disrepair and eventually razed in 1870. In 1909 the Native Sons of the Golden West erected a bell and sign on the original site of the mission and in 1940, with a grant from the Hearst Foundation, a replica of the original 1818 structure was erected. The church at Mission San Rafael, one of the smallest in the chain, is highlighted by a striking star shaped window, or Mudéjar, similar to that at Mission Carmel. Like Mission Dolores in San Francisco, San Rafael is overshadowed by an adjacent towering church tower. Served under four flags: Spain, Mexico, California, U.S.
From US-101 : Exit from US-101 at Central San Rafael. Turn left onto 5th Street. The mission is at Fifth and A Street. 11a - 4p daily. Please call 415-456-3016 to confirm. Tours for groups of 10 or more (call 415-456-3016).